You would think that living in a hotel is all luxury. After all, such luminaries as Mark Twain, Jack Kerouac, Ernest Hemingway and Simone de Beauvoir are among the dozens of writers who made hotels their homes at some point. Famed authors whose writing dragged along often booked in, locked up and grinded out their manuscripts. Tennessee Williams finished A House Not Meant to Stand at the Hotel Elysee (unpublished until after his death, which appears to be the publication path for my latest book). William Faulkner scribbled out As I Lay Dying in only six weeks during a stay at Manhattan’s Algonquin. After six years of research and intense writerly angst, Truman Capote is said to have completed In Cold Blood at New York’s Plaza Hotel. So, it is a life of glory, ink, typewriters and laptops, but it is not all keyboards and Jack Daniels. Dylan Thomas died of alcohol poisoning in 1953 at The Chelsea in New York, where it happens that Charles R. Jackson, author of The Lost Weekend, killed himself in 1968. Our fancy dryer. Dave worries readers will think that is his underwear on the left side of the rack, but if you look closely you will see it is an upside-down blue t-shirt with white trim. I would not be surprised one bit if these tragedies were connected to laundry. Anyone who has had laundry done in a hotel knows that the prices are geared towards people who don’t really care what they’re paying, because they’re not paying at all. Their employer is. And so, some business travelers report a single laundry load can cost $68 US, or a week’s worth at $300. One month of this and it is a wonder travelers don’t just pack a washer and dryer around with them. It would cost about the same. There is no “per load” bargain to be had either. Every item of laundry is listed and tagged and laundered at a per-piece rate. It is cheaper to treat socks as disposable items and just keep chucking the old and buying new pairs rather than send them to the hotel laundry. And so, we the ever-cheap, refuse to wash anything through the hotel laundry. We don’t have a sugar-daddy corporate boss to sign the check. 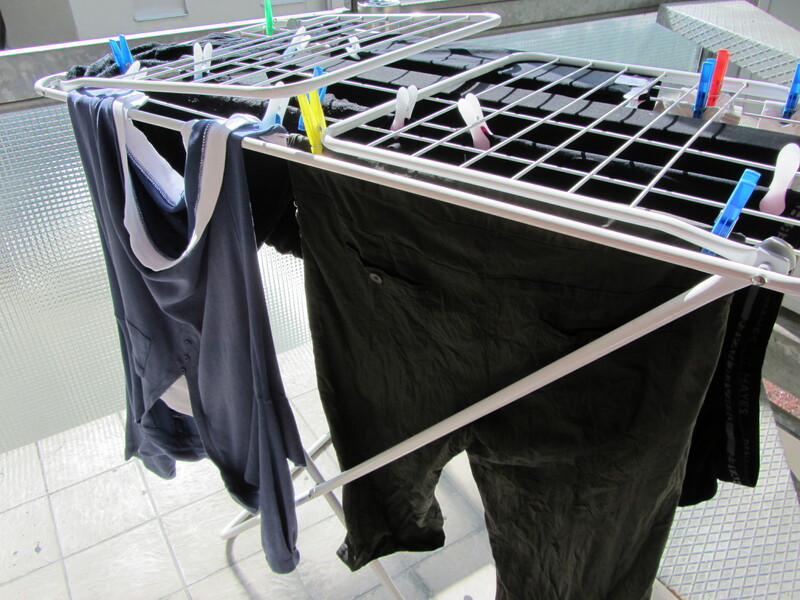 Instead, we handwash our clothes in the sinks (our suite has four sinks – imagine that), and in the winter dry them over the heater and in the warmer months outside on a rack on our post-stamp-sized deck. It is a little like living as a young impoverished student, but with better wi-fi service. I did try to find a laundromat, but the town only has two full-service laundry shops that charge the same as the hotel, although a desperate mother of two recently was given a laundry pass at one of them after the most persistent of campaigns. I could go and try that shop, but I did once and the Germans laughed me right out of the establishment. I’m not going back. Hand-laundering is not as hard as it seems. The hotel changes the bedding every week and provides towels. Without children, our laundry load is surprisingly light. 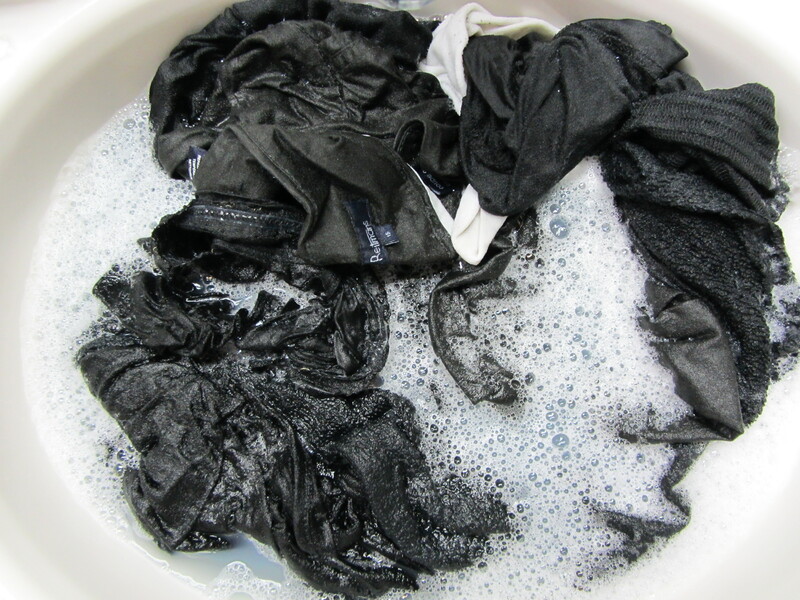 This gentlest of washing methods means that our clothes hardly look worn out at all, except for our socks. I’ve learned a few tricks, such as that sports-clothing dries very quickly; heavy sweaters and jeans very slowly, so my wardrobe is dominated by sportswear. I can speed up drying by pointing fans set to maximum at the drying rack. I have yet to resort to Seinfeldish oven-drying, but given the right circumstances, I would give it a try, if only I could figure out the settings on our state-of-the-art wall oven. Paris food – can you eat lamb’s kidney without having to sell your own? 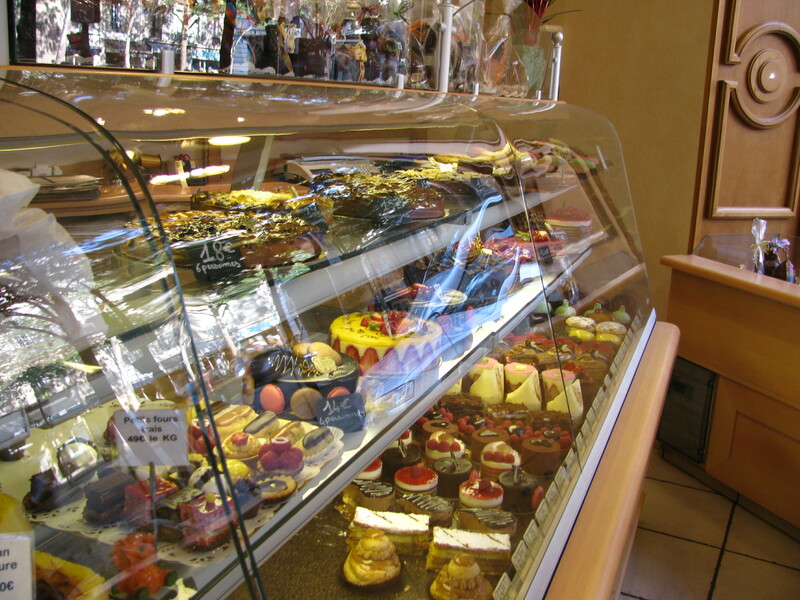 Sweet treats and good rib-sticking eats all in one shopping spot at French bakeries and patisseries. This post dating back to the Easter weekend 2011 repeatedly floats to the top of this blog’s hits (scroll down). Staring at the text in the file listings, it made no sense to me, but now that I’ve opened the post and seen that it comes with a photo of a lovely pastry display case on top, the world has once again fallen into its correct order. In the meantime, our little plateau in Switzerland is experiencing the spring-like joys of the Canadian prairies, that is to say the sidewalks are ankle-deep in grey ice and slush. Yesterday, I met another writer for the literary version of a jam session, and uncharacteristically, the Swiss railway system failed, so she had to complete the last part of her journey by bus. That was okay, until she landed in our little slush-ville. As it happens, both she and I are from Winnipeg, although we met here, not there. This is another oddity of Winnipeggers – they/we are everywhere, and strangely, we all recognize one another. I think it’s because we smile so much. Why do we smile? Because we’re not in Winnipeg, the hometown everyone loves to hate but will die defending. And so, the two of us pretended the weather was just fine, even though we both had slipped into some decline by the time we connected at the train station with our moppy hair and weather-mashed countenances. We entered into the Women of Winnipeg pact, which is that it was a ‘given’ that we both had started our day with fabulous hair and in the most beautiful of states, regardless of all the evidence to the contrary. She shared that while waiting for the bus she had met another Winnipegger. Neither of us is surprised by this. Then we marched through the slushy streets, pushing against the wind and pelting snow, feeling the slush ride up our pant legs and ooze ice particles into our shoes. Actually, I’m speaking for myself here, but I have to assume she was experiencing similar discomfort, but, of course she did not complain because she is from … Winnipeg, and by all bio-bred Winnipeg-weather standards, this was still a fine day weather-wise, although a little too warm for cross-country skiing. Pity. If only the temperature had dropped another eight degrees, it would have been a perfect day. By the time we arrived at Starbucks, my jeans were soaked up to my knees and I couldn’t feel my ankles. We were both in high spirits, and not just because of our proximity to caffeinated products and cheesecake, but because there’s nothing like an ice-dousing to make a prairie gal feel alive, or at least so numb that the absence of pain makes us feel alive. It took me about six hours to bring my core body temperature back up to normal. I should point out that in Winnipeg, it would have taken me six days. But enough of that. Here is one of Hobonotes’ top five postings – actually, it is usually in third spot, but I just can’t believe it. Dining in Paris: Can you eat lamb’s kidney without having to sell your own? The first question is why would you want to eat a lamb’s kidney anyway? Gross. That aside, French food enjoys a reputation that tops all others, but do they deserve it? It’s easy to trot into France’s finest restaurants and emerge satisfied that the nation’s cuisine is all that is claimed. But what about those of us who blanche at $75 lunches? What is French food like for the mid-to-low range diner? 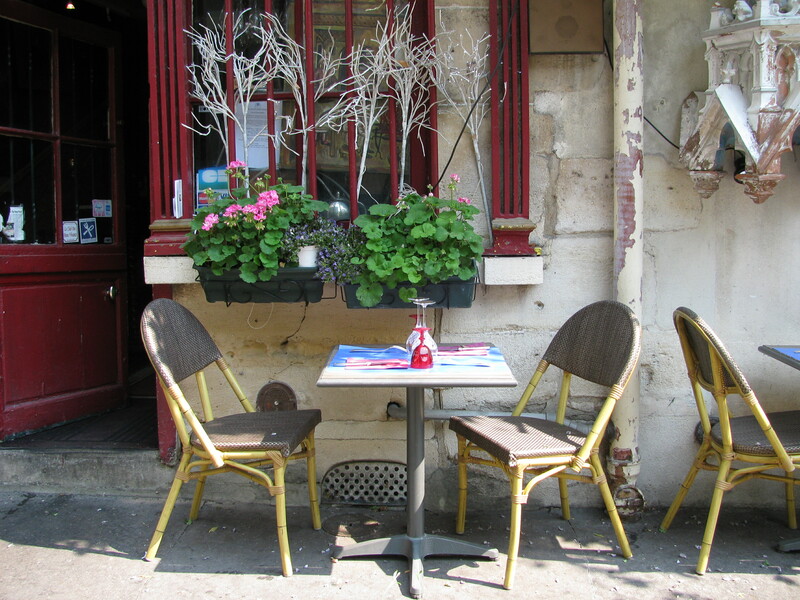 Does Paris even have a mid-to-low-range dining echelon? We-the-cheap conducted an in-depth 48-hour study on this topic. Here is what we found. Patisseries/boulangeries, that is, combination pastry and bakery shops, are great sources for not-so-expensive, but still delicious, day-time meals, and these shops are everywhere. Aux Armes de Niel, the boulangerie (photo above) at the corner down from our hotel sold soup-bowl-sized take-out quiches and other sustaining foods (mini-pizzas, although I don’t know if they called them that) for under $10 each. The alternative was our hotel breakfast at 20 Euros, that is, over $30 Cdn. each. No thanks. 400-year-old French cafe. No one was there. We're not saying this suggests that its age corresponded to the length of time customers waited for a meal, but you have to wonder. It also sold fabulous overfilled cream pastries, if such can be said to be truly over-filled. After all, this is whipped cream. 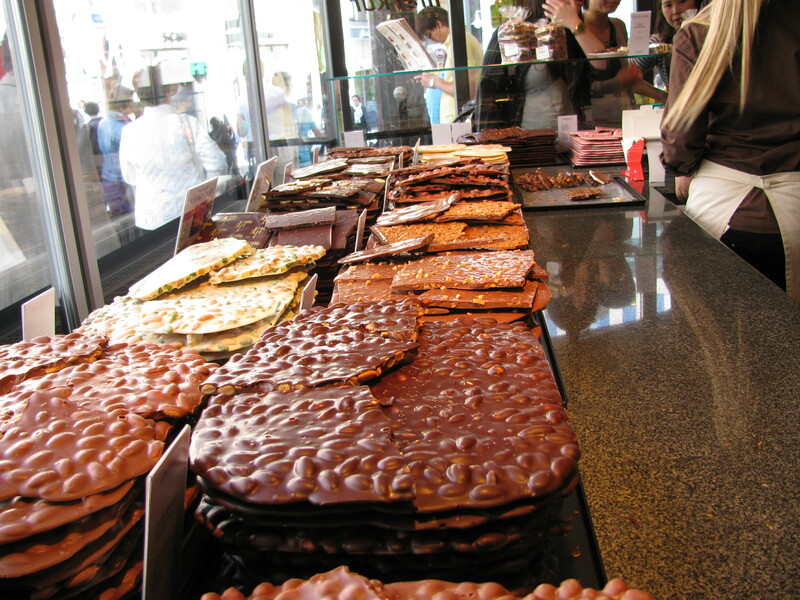 There’s never too much of it, so the French seem to think and, after sampling the goods, we agree. The pastries themselves were heavenly- flakey, light, everything Pilsbury dough-boy claims, but is not. French pastry is a perfect jacket for French fillings and toppings. If you’re deciding between French ice cream and French pastries as your guilt-food for the day, pick the pastries. The ice cream is good, but ice cream tops out at a certain point anywhere in the globe and I can prove it by producing homemade ice cream at my Ontario cottage that could stand up alongside the French’s. Note to cottage guests: But I won’t do that, because summer is the time to laze on the dock – not a good place for churning ice cream. Note to those searching for the greatest scoop of ice cream: Head to Atlanta, Georgia. Break into any home-kitchen and demand the contents of their churn. Seriously. You will not be disappointed. 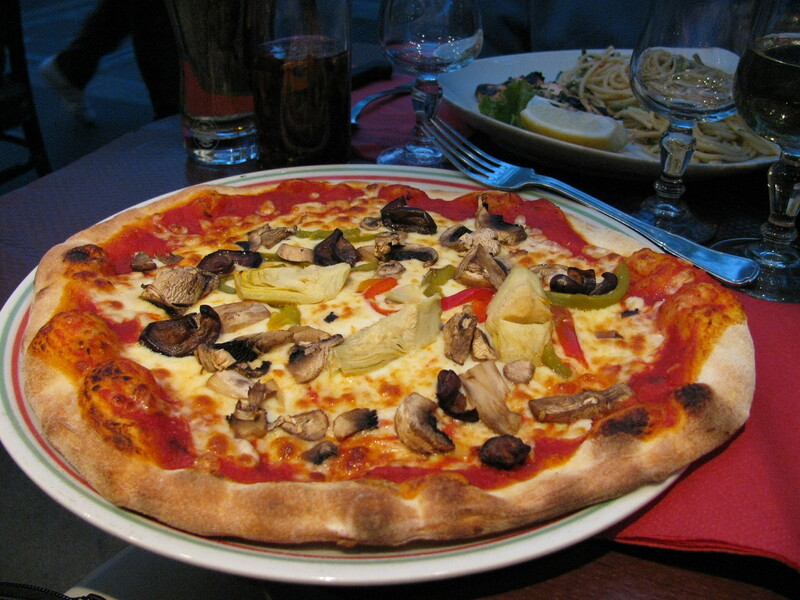 We scoured the streets for under-$30/person fare and found a few places, such as the San Remo’s Pizzeria near the Place de Marechal Juin roundabout and Pereire metro station. There, I had a delicious vegetarian pizza with artichokes that did not appear to have ever graced the insides of a jar. Dave had the grilled salmon and spaghetti alla chitarra, a substantial thick spaghetti noodle cooked to just the right degree of resistance and subtly seasoned. With a glass of the house wine and a beer, the total came to $36.90. Shocking, all the more so for having been so delicious. The atmosphere on this Paris sidewalk cafe was great, too. The staff (probably Italians) were nowhere near as snooty as French servers’ reputation suggests. FRIDAY, PART ONE – WRITE A NOVEL IN A MONTH? SURE, WHY NOT? I spent half of my day in restaurants yesterday, three hours of which was at our town’s new Starbucks for a writers meeting. The stated goal was to get as much writing done as possible while quaffing towering latte’s and downing cheesecake and other baked yummies, but I wrote exactly one word and spent the rest of the time chatting over one of the other writer’s novels. The gal is a genius and doesn’t even know it. She has crafted a mystery thriller that was good enough to hold my attention for 40 minutes, which, because she doesn’t know me well, she does not realize she has achieved something in the order of a miracle. I have a very short attention span. The point of this is to say that she was a little downcast at the prospect of rewriting. She has laid down the story in the sweep of Nanomo, a one-month challenge to write a 50,000-word novel in November. At other writer meetings, I’ve heard a Manitoba gal read off a stream of her novel’s narrative that came across in a rapid-fire distinctive voice. Here is more talent that may not be aware of her own merits. I lived in the world of hyperactive-rewrites for almost 10 years as a journalist and hope both these gals do not shelve their roughshod drafts, and keep rewriting, even if it takes a year or two, and in the meantime to look for an agent or publisher. 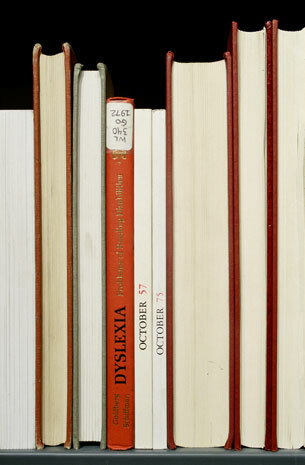 As they say in writing classes, we’re not writers, we’re re-writers. Everything needs polishing and re-polishing. Too many writers wait for some magical moment to start looking for a publisher, missing what could be amazing formative years in a writing career. Hold on to that day-job while doing all this rewriting, though. The publishing world is a cruel and competitive one. I reached my 50,000-word count early on (see hyperactive-writing-comment above) and finished my novel at 72,000 words, which I will now spend at least six months editing and then we shall see where that goes.